The historic homesteads and working stations located all along the Murray River are a brilliant way to explore the region. You've got a great opportunity to stay in these amazing homesteads with many of them lovingly preserved from an early era and rich in character, history and stories. Many of these homesteads were built by skilled craftsmen out of classic stone and are surrounded with gracious Victorian style gardens. Most of these historical properties are located near the Murray itself. You will be amazed with what you find as an experience in a big and beautiful homestead is the perfect way to enrich your soul and you can share with family and friends. This magnificent Victorian homestead offers every feature of the era, including tessellated verandahs and entrance hall, press wed iron high ceilings and marble fire places. Built in 1849 as the Globe Hotel it was frequented by many interesting characters of that era. One of these characters was Mrs McGillicuddy who was arrested for smoking opium and taken to the local goal. The top story of the hotel was burnt down approximately in early 1900’s, the bricks were relocated to the current Star Hotel. The Globe Hotel closed down in the 1920’s and had many other lives arriving at it’s recent destination, after extensive renovations. The Dining room is heritage listed with rugged brick walls and 14 foot ceilings, add to the experience of dining. Breakfast and dinner are served here. 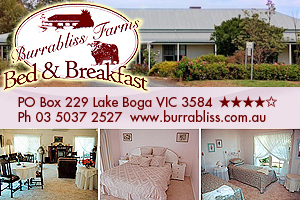 Burrabliss Farms is a traditional style B&B where guests enjoy the charm and comforts of a country style home. 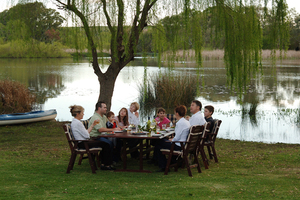 Surrounded by large gardens, Burrabliss Farms is less than a ten minute drive from Swan Hill at Lake Boga, where you can swim, fish, ski, sail and picnic. 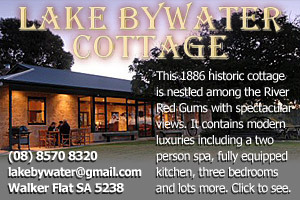 This historic 1886 cottage, nestled among the River Red Gums, has spectacular views of Lake Bywater and the River Murray. The classic old world charm of this cottage has not been lost with the modern luxuries including a two person spa, fully equipped kitchen, three double bedrooms, large lounge and dining area. 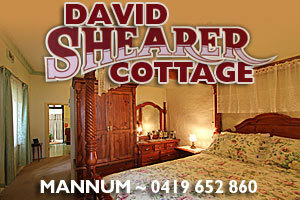 This historic cottage was the home of one of Mannum’s most important forefathers David Shearer. David and his brother John started the very successful Shearer Factory, first as general blacksmiths and then went on to be innovative manufacturers of farm implements and machinery. The original factory was located in what is now the car park next door to the cottage.David Shearer made Australia’s first steam car and built it in his Mannum factory. We also have a 20 Million year old “Miocene” fossil wall in the Courtyard outside of the cottage. 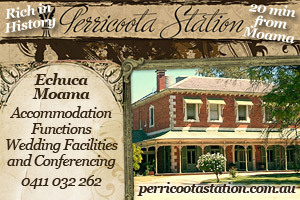 Welcome to Pompoota Homestead, situated on the banks of the mighty River Murray near Mannum, just an hour’s drive from Adelaide. The homestead is perfect for that special occasion with family and friends, with 5 acres of billabong, birdlife and river frontage. It doesn’t get much better than this! With your own billabong alive with birdlife, fish, frogs and water lilies, this is the ideal holiday for bird-watching, fishing, canoeing, or to just relax and unwind. For those who prefer the faster pace, make use of the lawned river front with boating facilities and your own private beach. 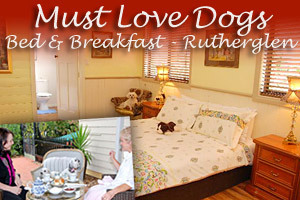 Located in South Australia’s, Riverland, nestled amongst the gum trees on the banks of the Murray River, Chowilla provides a unique experience for those wishing to escape to quieter and more laid back surroundings. 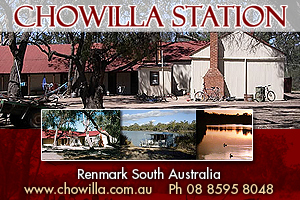 Chowilla offers affordable accommodation for families, groups and those who just need a break. Browse our site to see if we have what you need. 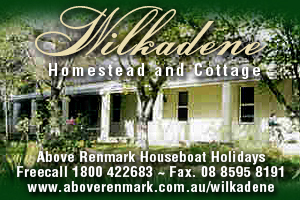 In its riverside setting, 15 minutes from Renmark, Wilkadene Cottage is like a home away from home. It is fully self-contained, has ducted air conditioning and will sleep up to 6. Located in the grounds of historic Wilkadene Homestead, you can take a self guided tour of this settlement once serviced by paddlesteamers.